Hey Bagels! We’ve just launched our own iPhone app! We think it just might be the #BestDatingAppEver. We’re very excited about it so we decided to do a series of articles revolving around mobile apps and cell phones in the dating world. We’d like to start with some science. Everyone knows that a first impression can make or break a romantic relationship. Does he leave a bad tip? He’s stingy. Got spinach in her teeth? Poor hygiene. Mismatching socks? Well that’s just not classy. We all judge our dates on how they look and act, but what about what they hold in their hands? Specifically, their cell phone. Smartphones these days have apps that can find you a date, track your fitness, and teach you how to cook, but the phone itself reveals more than meets the eye. Does she have an Android phone? According to a study by Hunch, she might just be an uneducated pessimist. No texts for her. Does he have an iPhone? He might be high-maintenance and more likely to text and drive. Watch out on the road. Your date’s phone can provide you with a wealth of information, and you don’t even have to snoop through it. Hunch’s study examined over 15,000 Hunch users who own a smart phone. Their data suggests that Android users and iPhone users differ on just about every trait available. 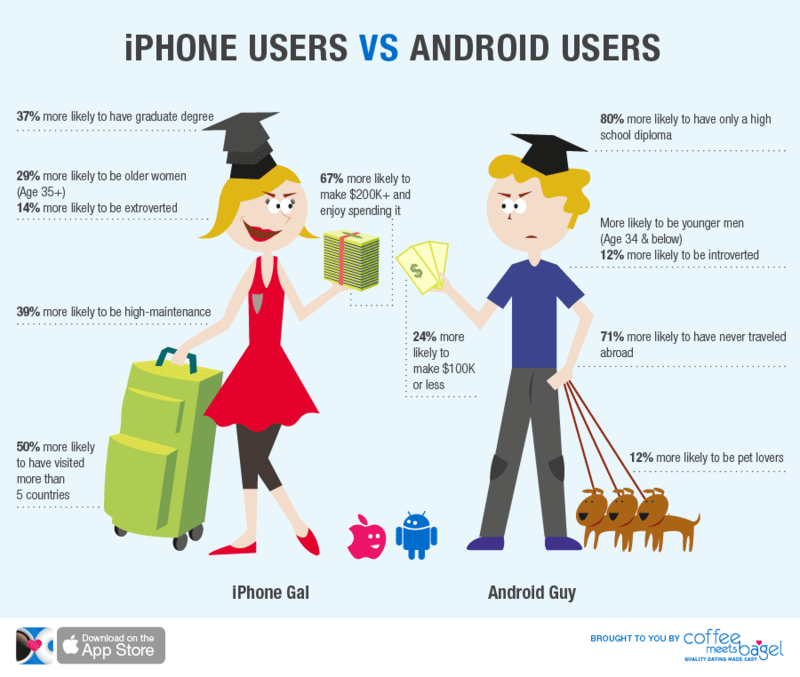 Above infographic illustrates what it means to date an iPhone girl and an Android guy. So what does this mean for you? Well, if you’re an iPhone girl, it means you probably shouldn’t date an Android boy. You’re too good for that, hun. If you’re an Android guy, then just don’t tell anyone. Are these recommendations completely serious? Of course they are. We used science.